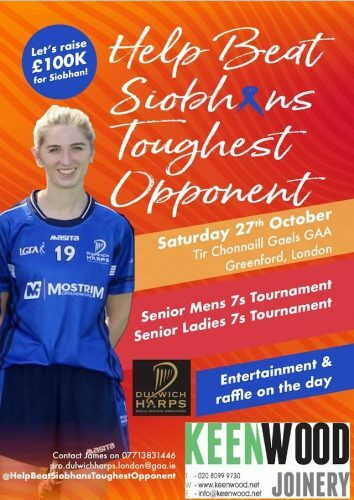 A 26-year-old Gaelic footballer has postponed her cancer treatment in order that she can attend a 7s tournament in London on Saturday, organised to help raise funds for a life-prolonging drug for her. 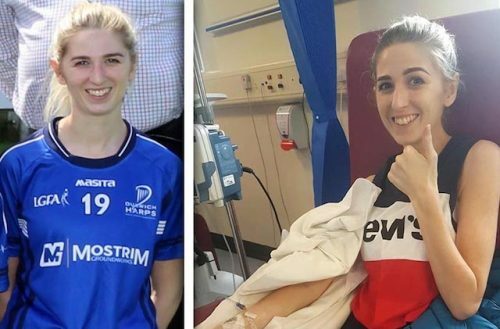 Siobhan McCann, who is from Castlewellan in Co Down and plays for South London’s Dulwich Harps, was diagnosed with colorectal cancer in April. Siobhan was due to receive her third treatment of a drug called Bevacizumab (Avastin) on Wednesday (24 October), but with the agreement of her doctor instead deferred it for one week to allow her to travel to London. She’ll make the trip with her parents, Brendan and Geraldine, and her brother, Ciaran, and her sister, Grainne, who will both be playing in the tournament at Tir Chonaill Park in Greenford for Siobhan’s hometown club in Down, St John’s GAC. Dulwich Harps Ladies secretary Maeve Wyle, who is part of the tournament’s organising committee, says Saturday is a chance for the GAA and Irish communities in London to show its support. “It’s a great opportunity to get the GAA community in London to rally around one of our own,” Maeve told the Irish World. “It’s a bit harder in London, than it would be at home, but everyone’s jumped on board straightaway. “It would have been very hard to raise that money without the support of the Gaelic community. 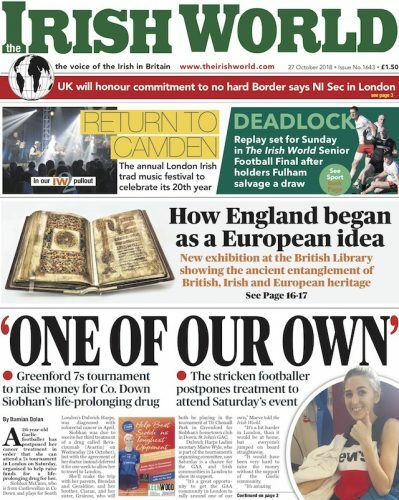 Having initially set a target of raising £100,000 to pay for the drug, which is not available on the NHS, Siobhan and her club appealed to the GAA community for help. The first fundraising event was held in mid-August and since then a GoFundMePage set up for Siobhan has raised more than £76,000. 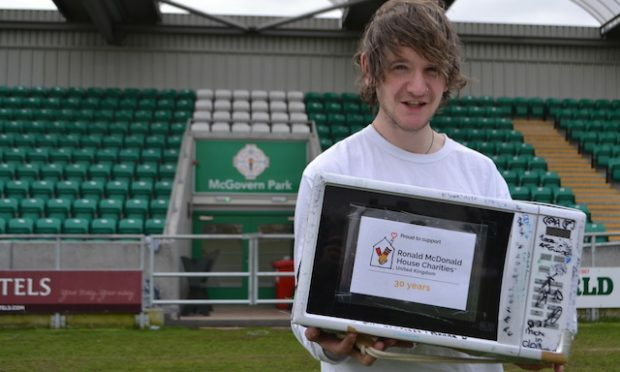 In addition, a charity event staged at her hometown club, St John’s, recently raised more than £51,000. We are very pleased to announce that a MASSIVE £51,426.98 was raised during Saturdays fundraising day. A life-long friend of Siobhan’s, Cormac McMullan, is overseeing the fund and he says it’s imperative to keep the fundraising going because of the uncertainty over the long-term cost of Siobhan’s treatment. “It’s definitely not over; we need to keep going,” Cormac told the Irish World. “We didn’t expect to hit the £100,000 so quick, but a lot more could be needed for the life-prolonging drug which Siobhan is currently on. “The doctor said they won’t know how much will be needed [or] how long Siobhan can stay on the treatment. “We’re going to have to see how that drug affects the tumours. It might work, it might not. It might work for a while, and then her body might start to reject it. Cormac says Siobhan has been “overwhelmed” by the level of support and the “well wishes” she’s received. “She’s speechless at the amount of money that’s been raised and the support she’s been receiving. In addition to Bevacizumab (Avastin), Siobhan is continuing to undergo intravenous (IV) and oral chemotherapy, with all three drugs administered fortnightly on the same day. 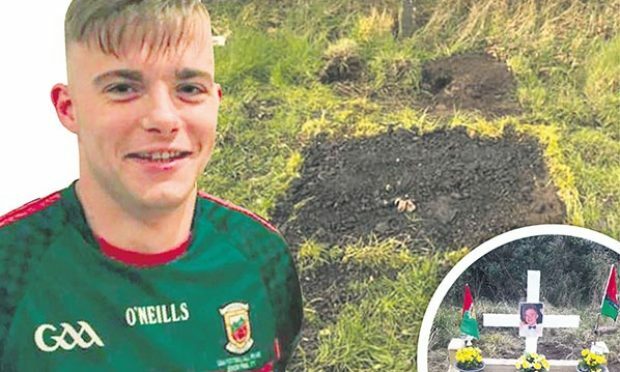 “It usually takes her ten days to recover from the treatment, so she maybe has three or four days of feeling okay before she has to start the drug again,” said Cormac. Saturday’s fundraising event will consist of a Men’s and Ladies’ 7s tournament followed by a presentation for the winning teams, live music and raffle in the clubhouse afterwards. As well as members of St. John’s GAC, there will also be teams taking part from Hertfordshire and Birmingham, joining various clubs across London. The first games of the tournament will commence at 12 noon. However, on 18 July she received the devastating news that the cancer had spread to her liver and that surgery was no longer an option. “She just wanted to go back to a bit of normality in London. I didn’t expect her to play, but she wanted to and she actually played really well when she came on in the second half. She just loves football,” added Maeve.